(February 11, 2019) -- In its 34th year of honoring the nation's best high school athletes, The Gatorade Company, today announced Parker Stokes of Maine-Endwell High School as its 2018- 19 Gatorade New York Boys Cross Country Runner of the Year. Stokes is the first Gatorade New York Boys Cross Country Runner of the Year to be chosen from Maine-Endwell High School. The award, which recognizes not only outstanding athletic excellence, but also high standards of academic achievement and exemplary character demonstrated on and off the field, distinguishes Stokes as New York's best high school boys cross country runner. Now a finalist for the prestigious Gatorade National Boys Cross Country Runner of the Year award to be announced in February, Stokes joins an elite alumni association of past state award-winners in 12 sports, including Lukas Verzbicas (2010 -11, 2009-10 Carl Sandburg, Orland Park High School, Ill.), Donn Cabral (2007 -08, Glastonbury High School, Glastonbury, Conn.) and Chris Derrick (2007 -08, Neuqua Valley High School, Naperville, Ill.). 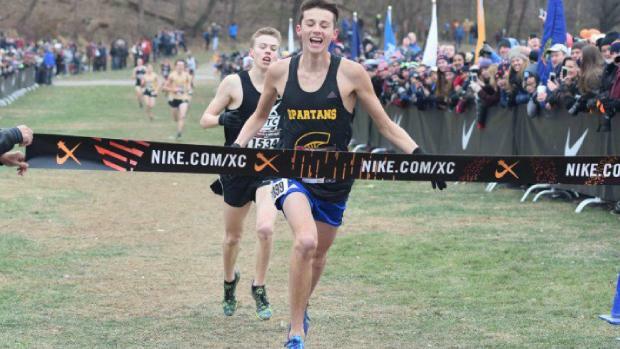 The 6-foot-3, 147- pound senior won the Nike Cross Nationals New York Regional championships this past season with a time of 15:51. Stokes placed 22nd nationally at the NXN Final. He finished second at the Class B State Championship meet in 15:57 and broke the tape at the Section 4 championships, the Tully Invitational, the Marathon Invitational, the Newark Valley/Bob Green Invitational and the Owego Invitational. Also a standout swimmer and a talented musician, Stokes is vice president of his school's Student Council and has volunteered locally as an Eagle Scout with the Boy Scouts of America. "Parker is one of the most disciplined athletes I've ever known," said Maine-Endwell coach Megan Jacoby. "He's also extremely humble and kind, and he's been an amazing team leader and teammate." Stokes joins Gatorade New York Boys Cross Country Runners of the Year Mason Gatewood (2017-18, St. Anthony's High School), Ty Brownlow (2016-17, Liverpool High School), Ben Petrella (2015-16, Liverpool High School), Bryce Millar (2014-15, Fayetteville-Manlius High School), and Mickey Burke (2013-14, Rush-Henrietta Senior High School) as athletes who have won the cross country award since its inception in 2007. As a part of Gatorade's cause marketing platform "Play it Forward," Stokes has the opportunity to award a $1,000 grant to a local or national youth sports organization of his choosing. He is also eligible to submit an essay to win one of twelve $10,000 spotlight grants for the organization of choice, which will be announced throughout the year.